Buy wholesale Lipton Tea from the restaurant supply superstore for your restaurant, hotel, breakroom, or coffee shop. Lipton Tea is found in 7 out of 10 households and restaurants in america. Lipton Fresh Brewed Sweet Tea - 3 Gal. Lipton Southern Sweet Tea - 3 Gal. Unilever Best Foods Lipton Iced Tea Mix Bulk Bags - 1 Oz. Unilever Best Foods Lipton Autobrew Blend Tea Bags - 3 Oz. 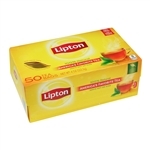 Unilever Best Foods Lipton Smooth Blend Iced 24 Bags Tea - 1 oz. Unilever Best Foods Lipton Lemon Iced Mix Bulk Sugar Tea - 12 oz. Unilever Best Foods Lipton Smooth Blend Autobrew Premium Tea - 4 Oz. Unilever Best Foods Lipton Smooth Blend Steeping System Tea - 3 Gal. Unilever Best Foods Lipton Iced Tropical Tea - 3 Gal. Unilever Best Foods Lipton Iced Tropical Tea - 1 Gal. Unilever Best Foods Lipton Instant Unsweetened Tea - 3 Oz. Tea Lipton Family Size Bags - 6 Oz. Lipton Sweet Green Tea With Citrus - 3 Gal. Lipton Unsweetened Peach Iced Tea For Auto Brew - 3 Gal. Our Lipton Teas for your breakroom, restaurant, or hotel come in a variety of flavors and packs for your convenience. We stock a lot of their exotic flavors that not many stores stock. A nice tea after dinner or lunch helps with digestion and promotes well being.